Hello :) My name is Chelcie and I live with my husband matt and our baby daughter. Luna and Hudson the dogs and Dino the water dragon. 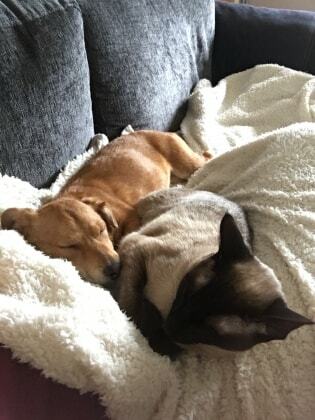 We are both animal lovers and between us have owned and loved a variety of pets including small rodents, rabbits, guinea pigs, tortoises, birds, a variety of different lizards, cats and dogs. we rescued Luna who is a small/medium mix breed. She suffers with anxieties and we have been using doggy daycare while we are at work which we have found really helpful. To help Luna with her difficulties in trusting humans, we got her a companion, Hudson the Cavalier King Charles. Together they are crazy but love other dogs and are both very friendly. We have decided that we would like to offer our home, love and attention to your furry/scaled/ feathered family member. On a usual day, we take Luna and Hudson out for a walk for a minimum of an hour, normally nearer 2 hours and have lots of playtime in the garden. Our garden is secure with 6ft fences. We are very fortunate with our location so walks are varied and include beach, parks and woodland. We would of course keep you updated with lots of pictures :) We do have very limited availability due to shift work so cannot commit to regular days but do often know our rotas in advance so please feel free to contact me regarding dates. Please note: any overnight visitors must be happy to sleep in either a crate or a bed in our lounge. We can of course leave lights/radio on for them but can no longer offer the comfort of our bed as our daughter often ends up with us! !